"A resounding success!" John Riddell, Louis Proyect, and Ben Silverman report on a major step forward for anti-capitalist organizing in the environmental movement. I was unable to attend the Ecosocialist Conference in New York City on April 20, and it is clear from all reports that I missed an important and inspiring event. The meeting was organized by the Ecosocialist Contingent, the alliance that participated as a united anti-capitalist voice in the demonstration against the Keystone XL Pipeline in Washington on February 17. Initiated by members of Solidarity and the International Socialist Organization, the Ecosocialist Contingent quickly expanded to include the broadest range of left organizations and individuals yet seen in the U.S. environmental movement. John Riddell wrote his report specifically for Climate & Capitalism. His report can be found below [editor's note]. John is best-known as the leading historian of the Communist International, but he is also active in the fight against Enbridge's tar sands pipeline in Toronto, and a founder of Toronto Bolivia Solidarity. Louis Proyect, a long time socialist activist in the New York City area, moderates the popular online discussion forum Marxmail. His report is published on his blog, The Unrepentant Marxist. Ben Silverman is a New Jersey based socialist and environmental activist, and a member of the International Socialist Organization. His report is published on his blog, The Red Plebeian. The conference was arranged in just six weeks by organizers of the Ecosocialist Contingent in the mass demonstration against the Keystone XL tar sands pipeline in Washington February 17. It was supported by 29 groups who subscribed to the Ecosocialist Contingent statement for "system change, not climate change." The 240 attendees "• more than double the number organizers originally expected "• included members of several socialist currents and many unaffiliated socialists, but the real strength of the conference lay in participation by a great number of young climate-change and ecological activists. Most participants were from the New York region, but a few came from as far away as Maine, Oregon, Texas, and Vancouver, B.C. The range of opinion was wide. Many participants, including spokespersons for the Green Party, did not term themselves anti-capitalists, but agreed on the need for "˜system change' and a break from the corporate-dominated Democratic Party. Among them was the first featured speaker, Jill Stein, the Greens' presidential candidate in 2012. "This is an incredible outpouring of support of those not going forward with Obama but forward with the 99% for system change and fundamental justice," she said. "Capitalism is trying to kill the planet, but the people are rising up." Her remarks reflected the view of many participants that organizers of the February 17 mass demonstration had weakened the protest's impact by presenting it as an expression of support for Obama, echoing his "forward" and "clean energy" slogans, for example. As several speakers noted, the Democratic administration now seems very likely to approve the Keystone XL pipeline. The February 17 action thus showed both the power of environmental protest and the futility of relying on the Democrats. As Jill Stein said, "the demonstration told Obama, "˜we've got your back,' and then he stabbed us in the back." For example, the panel on "Carbon taxes and market approaches" heard Teamster and Green Party activist Howie Hawkins' reasoned defense of carbon taxes as an immediate measure to alleviate climate change that enjoys "solid support." The second presenter in this session, Dan Piper of Socialist Action, counterposed the need for working people to "seize command of the productive apparatus." There is no way to end environmental destruction through reforms, he argued. For example, cities based on cars or on public transit are mutually exclusive alternatives. But how can we link immediate concerns like Keystone XL to the need for system change? Chris Williams, author of Ecology and Socialism, addressed this point in the closing session by calling for the building of a movement through which "we change our relationship to each other and the planet. We need to shift the pendulum of power - and, ultimately, get rid of it." The climate change movement showed its potential by delaying Keystone XL, Williams said, "and when it is approved, we should demonstrate again." Widely different approaches were also evident in discussions of participation in elections. "We are in uncharted waters," said Joel Kovel of EcoSocialist Horizons. "There are no market solutions, and no electoral solutions either"¦. Ecosocialism is a spiritual question; our organizing aims to direct spiritual forces to the Earth and nature," he said. Gloria Mattera of the Green Party agreed that "the market system has failed," but stressed the need for "electoral expression in order to engage the broader population," calling for "a broad electoral alliance to challenge the power of the corporations." Speaking in the opening plenary, Richard Smith stressed the need for wholesale economic transformation to save the planet. "Drastic retrenchment is required. Three-quarters of goods produced are not needed at all." The argument for this view is strong, but as stated it doesn't seem to recognize the need to overcome global inequality, in particular the increasingly desperate needs of billions of people who lack even the most basic requirements of life. A well-attended panel addressed the broader issue of "Race, Gender, and Environmental Justice." The first victims of climate change are the peoples of poor countries, and "we have a lot to learn from environmental movements in the Global South," said Heather Kangas, a Baltimore-based members of the International Socialist Organization. Moreover, "the environment is not just the natural world but also where we work, live and play - it is urban and suburban as well as rural," she said, advocating that the ecosocialist movement link up with Environmental Justice groups found among peoples of colour. Amity Page, a journalist with the Amsterdam News, described the systematic racism of the U.S. emergency management agency (FEMA) and other authorities after the Hurricane Sandy disaster. People of colour were regarded simply as "looters," she said. FEMA and police did not enter subsidized public housing to help those in need and kept other assistance workers from going in, saying it was too dangerous. "A disaster heightens the inequalities that are already there," she said. Abbie Bakan, head of gender studies at Queen's University, Ontario, took up a case study: the Israeli government's treatment of Palestinians. They have undergone an "indigenous experience, enduring environmental racism," in which slogans like "make the desert bloom" promote the notion that "the good earth comes only from the colonial project." "There has been an environmental justice movement all along among indigenous peoples, people of colour, and in the Global South, but you have to have anti-imperialist eyes to see it." "Every climate change activist must also be an antiwar activist." "We will learn much more about racism and how it is manifested through our activity in the environmental movement." The event's program was well-run and varied, with 43 speakers and facilitators. Aside from the panels discussed here, there were sessions on agriculture/food, fossil fuel divestment, Hurricane Sandy, labour, and Green Left history. No discussion was scheduled on ecosocialist activities going forward, but it was generally felt that the conference created a strong foundation for future activities. Alongside Chris Williams' call for another Keystone XL protest, there was talk of holding another ecosocialist conference down the road. The Ecosocialist Contingent will hold a teleconference May 6 to discuss next steps. 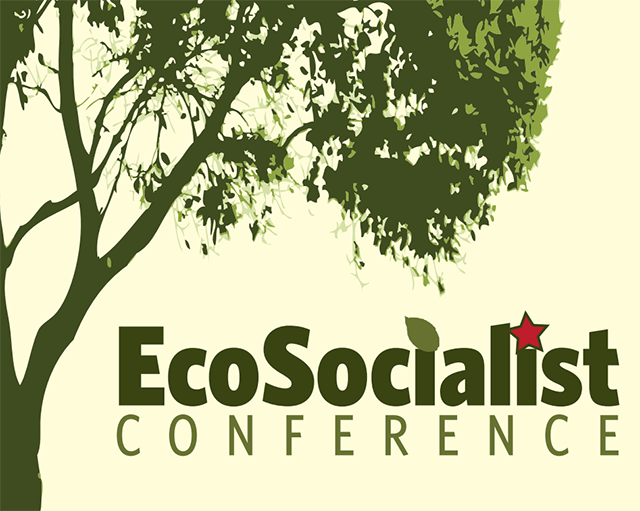 For information, write ecosocialistconference [at] gmail.com.